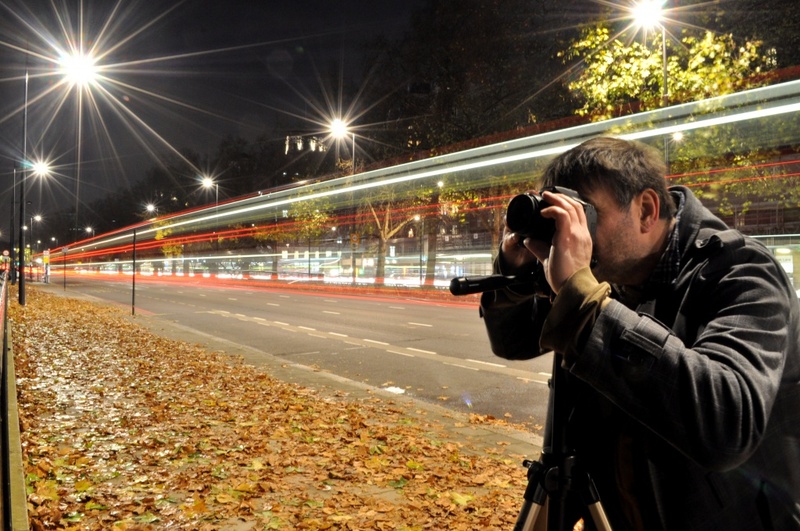 Here's Rich doing a long exposure just opposite from The Dorchester... 15 seconds in fact.. Hat's off to Rich for staying so still for so long..
love this, those starburst lights are great and nice to see all those RED trails! It was pretty easy to stay still as my knees and back had locked up!!! If this was hand held then hats off to you. Love the light trails and star lights. Star burst are awesome. So that's Rich - the master at work - haha nice. I'm impressed!! Did he stand that still before or after the mulled wine?? @robinwarner we did wait a while in case you turned up :-)..
Love how he is standing still with the world whizzing by behind him! great job boys. you scratch my back helping hands. great shot mate - loving those light trails....really ? Rich stayed still for 15secs?? @azza_l Remember you did a 30sec pose in leake st! Seriously good job staying still for that long Rich, I don't see any movement at all, @rich57. great shot, the traffic behind is fantastic.